Perhaps the best thing the Academy did with their nominations is throw a Best Animated Feature nod to The Secret of Kells, thus bringing attention to a feature film most of us hadn’t heard of before today. Now, folks are scrambling to see it for themselves and judge how it stacks up against its fellow nominees Coraline, Fantastic Mr. Fox, The Princess and the Frog, and Up. Unfortunately, we’ll have to wait until this Spring to give it a shot. Thankfully, WildAboutMovies [via IMPAwards] has premiered the US poster for the film and it looks pretty good. But what looks amazing is the promotional trailer. I’m sure plenty of you have already YouTubed what you could find when the film was announced as an Oscar contender, but after watching the promo trailer, I have to say the film at least looks remarkable. It’s pretty incredible that in this day where CG animated films seem to dominate the Hollywood mainstream, this year’s nominees include two stop-motion films, two 2D films, and only Up as the CG movie. Check out the poster and the promo trailer after the jump along with a brief synopsis. We’ll be sure to let you know the release date for The Secret of Kells when we hear it. 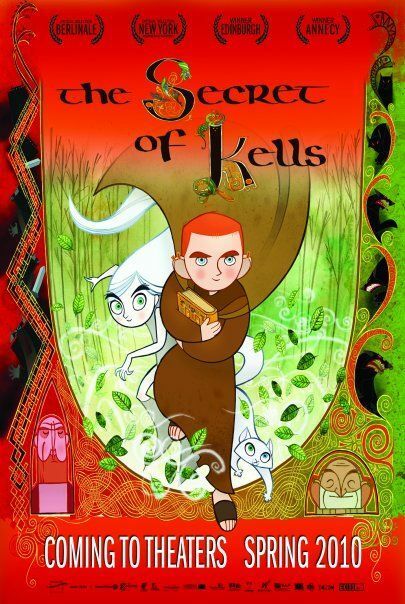 Just so you’re not confused, “Brendan and the Secret of Kells” is the original name for the movie; this isn’t a trailer for a different picture. In the movie “The Secret Of Kells,” young Brendan lives in a remote medieval outpost under siege from barbarian raids. But a new life of adventure beckons when a celebrated master illuminator arrives from foreign lands carrying an ancient but unfinished book, brimming with secret wisdom and powers. To help complete the magical book, Brendan has to overcome his deepest fears on a dangerous quest that takes him into the enchanted forest where mythical creatures hide. It is here that he meets the fairy Aisling, a mysterious young wolf-girl, who helps him along the way. But with the barbarians closing in, will Brendan’s determination and artistic vision illuminate the darkness and show that enlightenment is the best fortification against evil?